Director Alexander Payne (Sideways, The Descendants) excels in telling seemingly small stories with emotionally thoughtful and rich performances. 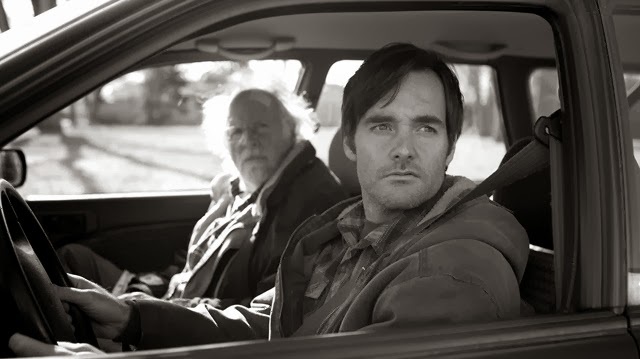 Nebraska is a hilariously poignant film about families and looking back through our lives and rediscovering our personal histories. Payne uses the film's road trip style narrative to explore themes of elderly stubbornness and old men. Bruce Dern plays Woody Grant, a senile alcoholic, who is determined to make the 850-mile walk from Billings, Montana to Lincoln, Nebraska in order to redeem his Publishers Clearing House type million dollar prize, and validate his entire life in the process. On the way, with the help of his family, Woody gets side tacked, bumbles, fumbles, and revisits a past life back in hometown of Hawthorne, Nebraska. Saturday Night Live veteran and comedian Will Forte is sensational as Woody's well-meaning son and travel companion, David. Forte's understated appeal and all-American straight man set against Dern is a finely executed balance of acting and writing. Payne takes a very midwest, heartland look at families, revisiting the characters' pasts through the road trip through line. David sees his parents as whole people with lives before he was born and builds context for his raising and childhood for the first time without any cheese or strain. These moments are done quietly and genuinely with gentle looks and dialogue. It's an unsentimental, folksy vision of small town life from another time and palce. As usual, Payne perfectly casts his film down to the minor characters, particularly a couple of bumbling brothers who steal every scene they are in. Bob Odenkirk, who does a lot with just a smile, is just the right balance to the family adding a little more reason as the mildly more successful son and brother. In contrast, June Squibb as Woody's wife is so much fun, packing laugh out loud humour with some boisterous yelling as the long suffering mother and wife. She's done caring and speaks her mind with a knowing playfulness. Nebraska is full of true moments of character and familial reverence. Payne has crafted a tight story about finding a place in your dysfunctional family that speaks to adults and elders in a way to bridge generations. It's a story constructed as an adventure yet veers off into personal history and clarity. Forte and Dern are sensational playing off each other superbly as the put upon son and his cranky father. Nebraska, the state and the film, stand in for a new perspective on how our lives became to be, filmed in glorious black and white Cinemascope.